One cannot deny the effect that Jim Harbaugh had on the San Francisco 49ers this year, his first year with the club. He took a 6-10 club that had underachieved all last season and instilled a swagger, a physicality and a confidence and led them to a 13-3 season and an appearance in the 2012 NFC Championship Game. He resurrected Alex Smith's career, gave Frank Gore one of his best seasons and had one of the best defenses in football. 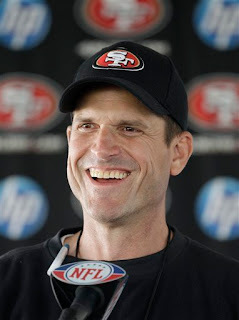 And for all of that, he is the 2011 Associated Press NFL Coach of the Year.